While you focus on spending quality recreational time with your friends and family, we’ll do the heavy lifting of keeping you safe! Read on..
1) How safe are the activities mentioned? We make sure all our activities are to be carried out under the professional guidance of our staff. All activities are safe unless mentioned otherwise based on your general health condition. 2) Is the staff trained professionally? All our staff members undergo training in various specialist courses at regular intervals. All our technical staff are professionally trained in Life saving techniques/CPR/First aid. 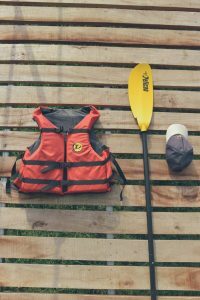 3) Do I have to wear Life jacket during all activities? 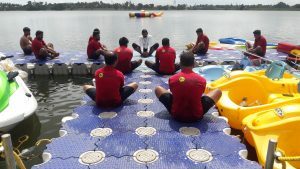 As a standard measure of safety, we do not allow visitors to go beyond the Red Zone without properly securing a life jacket- Hence all activities are to be done only with a life jacket. 4) Is this a safe/good place for Families? The adventure camp is both Family friendly and youth friendly. Adequate provisions are made such as changing rooms, restrooms and a restaurant for refreshments for people across different age groups. We also have activities that are suitable for kids as well as people who are aged. 5) Can I take my camera/phone for the activities? We highly recommend not bringing any electronic equipments, precious jewellery for any of the activities. Provision of lockers are made to keep it safe while you are indulging in the activities. However, we do understand the value of memories you’d like to capture and you can take your phones but management will not be responsible for any loss incurred due to that. 6) What is the plan laid out for emergency situations? We take safety as our number 1 priority, but sometimes when there arises an emergency situation- our trained team is capable of handling it. Emergency contact numbers of nearby hospital, police station and fire brigade are also available at the set up. 7) What should be the general health for the activities? Activities suitable for different age groups and health conditions are available. In some cases guests having cardiac health, major vertebral problems, who have undergone surgery in past 3 months or who are pregnant are not recommended to indulge in adventure activities. 9) Can I leave my kids alone for the activities? Minors below the age of 8 years are to be always accompanied by adults. If you would like us to look after the minors under your absence, please let us know and we will be happy to assist.